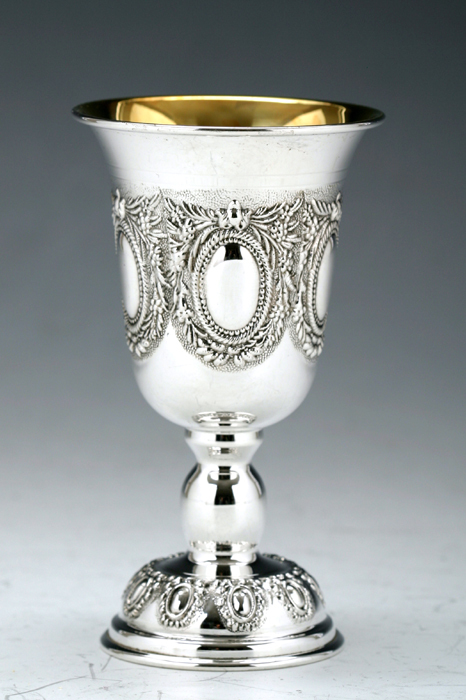 Hadad Silversmiths created this 925 Sterling Silver Kiddush Goblet to decorate your Shabbat & Holiday table.Made in Israel by Jewish Laborers.Wt 67g. Ornate floral border surrounds a vertical oval cameo to create a lovely design that circles this elegant Kiddush Goblet. Sterling silver saucers are available with similar patterns for purchase separately to create a matching set.